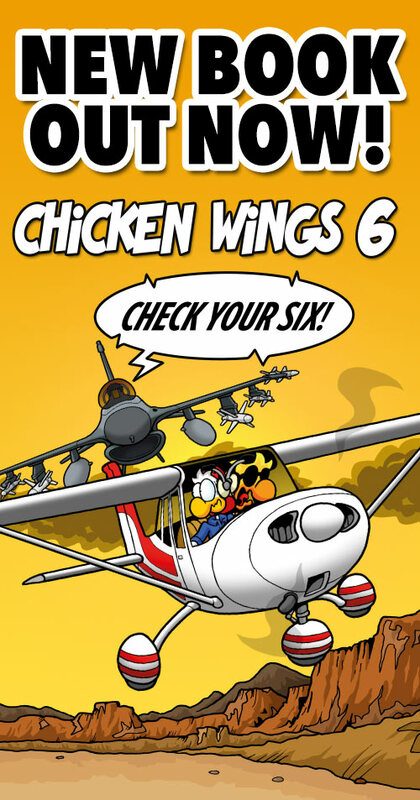 Hey there, fellow chicken aviators! One thing Stef and I can’t agree on at the moment is what will be on the cover of the next book. SHould we do more chickens? less chickens? more planes? less planes? put the Corsair on the cover again which has been suggested before numerous times. We are confused and undecided, and on top of that DIVIDED! We need you guys as a tie-breaker! So we thought we would turn it into yet another contest/raffle. Write us what you think would be funny, or cool, or awesome on the next cover. 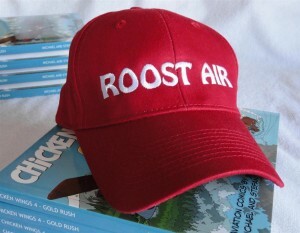 We will then raffle off 2 “Roost Air” hats from your entries. Multiple entries are allowed since we want as many ideas as possible. And we will let you know where the hats go in a week from now on Wednesday the 16th. ‹ Black Friday & Cyber Monday: 25% Discount! Do you need to ask how many planes you should put on? The answer to that will ALWAYS be more. You should have Julio out on the wing of Chuck’s Corsair trying to fix it while Chuck is flying! Then add all the other planes in a collage in the backround with a bunch of little easter eggs hidden among them. How about a balloon, our oldest form of aviation? Maybe Chuck+Co. trying a hand at fire aviation (fixed or rotor wing). Or maybe something involving a drone, since it seems to be an emerging issue. What I was initially thinking of was the title “Fasten Your Seatbelts” and we’d show Hans in an airliner sweaty and trying to get his seatbelt fastened. But Stef thought it might not be PC enough and there aren’t any planes in the picture / on the cover…. It should be funny to put all roost air guys on a biplane (just to say.. a Tiger Moth) some inside the cockpits and some on the wings (a terryfied Hans!). Family, lets meet thier families. JULIO must have 4 girls and a boy! And Drones. Chuck Aaron teaching Chuck how to really fly a heli. I would love to see the gang in the hangar. @ Mike. Draw names yet brother? WINNER WINNER – CHICKEN DINNER! Thank you everybody for participating. We raffled the ball caps off and we will take all your input into consideration.There wasn’t a single one that totally stuck out but lots of great food for thought. I liked the clown plane idea (FB group), but we will see if some sort of a “theme” develops when we start lay-outing …. Keep tuning in, there will be more contests and giveaways shortly. Winner please PM us with your addresses!